"Fast, safe and efficient EMT trauma shears make life easier for medical workers everywhere!" 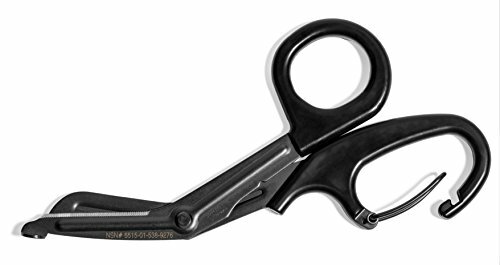 These premium trauma shears are a unique, patented improvement on the ubiquitous disposable EMT shear. Clip them onto your waist, never lose them thanks to the built-in carabiner and cut anything from bandages to leather to seatbelts with ease. The blades and rivets of these medical scissors are made from high quality Japanese surgical grade stainless steel, and each blade features precision milled serrations for fast and efficient cutting. The scissors measure 7.5 inches from tip to endmost point of the handle - the standard size for hospitals, operating rooms and ERs. Tired of losing shears from pockets or holsters? Our premium design features a patented, steel-reinforced carabiner that allows you to clip the shears directly onto your waistband. Keep them within reach at all times when you're on the job! We're proud to say that many EMTs, nurses and others in the medical field have told us repeatedly how much they value our shears. The injection-molded handles are large and comfortable, and the carabiner is a welcome addition. These have been called by medical workers "The best trauma shear they've ever had!" Your shears are made with a high quality manufacturing process that creates a strong, professional and long-lasting tool. You'll be sure to have these scissors for years to come, so pick a color you like! They also come in Black, Blue, Red and Neon Pink. CUT FAST & SAFE EVERY TIME - Cut anything safely and efficiently with these sharp, professional grade medical scissors. With these fluoride coated shears on your belt you'll make quick work of anything from bandage and tape to leather or seatbelt webbing. SURGICAL STAINLESS STEEL SHEARS - These EMT trauma shears feature blades and rivets made from Japanese surgical grade stainless steel, with precision milled serrations along the blade. The scissor is 7.5 inches long, the standard size in most hospitals, operating rooms and ERs. FEATURES PATENTED CARABINER - Your set of surgical scissors are equipped with a unique, steel-reinforced carabiner so they can easily clip onto your waist and be within reach at all times. That means no more losing trauma shears from a pocket or holster! PERFECT FOR EMT WORKERS, DOCTORS & NURSES - We're proud to say we've had incredible feedback from those working in the medical field who use our shears. The carabiner is convenient and the handles are smooth for easy cleaning and offer a large, comfortable opening for your hands. These scissors are also autoclavable at 290F/143C for hospital use. View More In Instruments & Surgical Tools. If you have any questions about this product by Carabiner Shears LLC, contact us by completing and submitting the form below. If you are looking for a specif part number, please include it with your message.